We checked out a new website called Publiscize, where scientists can write short summaries of their published research for the public to read. Read on for a review of Publiscize and an interview with its founder, Rob Seigel. North Americans will enjoy a partial solar eclipse this afternoon. Read more to find out the best ways to view the eclipse! 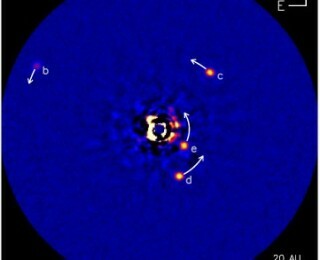 The authors break in the new Gemini Planet Imager with spectroscopy of the well-studied but not yet well-explained exoplanets HR 8799 c and d.
Planet-planet scattering can either be a good thing or a bad thing for the planetesimals caught in the crossfire. Like many things in life, the key is moderation. The authors of this paper try to figure out how many exoplanet systems with eccentric planets are likely to still have their debris disks after experiencing a planet-planet scattering event. Saturn’s moon Iapetus has been bombarded pretty heavily by debris from the outer Solar System. But it’s not TOO smashed up — its strange, 20-km-high, equatorial ridge is still standing. 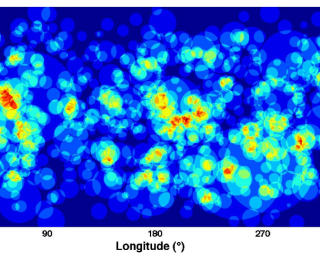 The authors of this paper simulate the bombardment of Iapetus to figure out how much mass could have collided with the moon without destroying the ridge.